This is the final of five exclusive extracts relating the story of Mezyan Al Barazi, a Syrian expatriate living and working in the United Arab Emirates, and his efforts to support the revolution in his home country. At turns informative, tragic, and edge-of-your-seat suspenseful, Godfathers and Thieves reminds us that the next revolution, like the last, will likely be crowdfunded. By ELIZABETH DICKINSON. As violence spread across Syria in 2013, it seeped into humanitarian aid work. That fall, the Syrian government put the Palestine refugee camp of Yarmouk, a thriving suburb just miles from central Damascus, under siege. 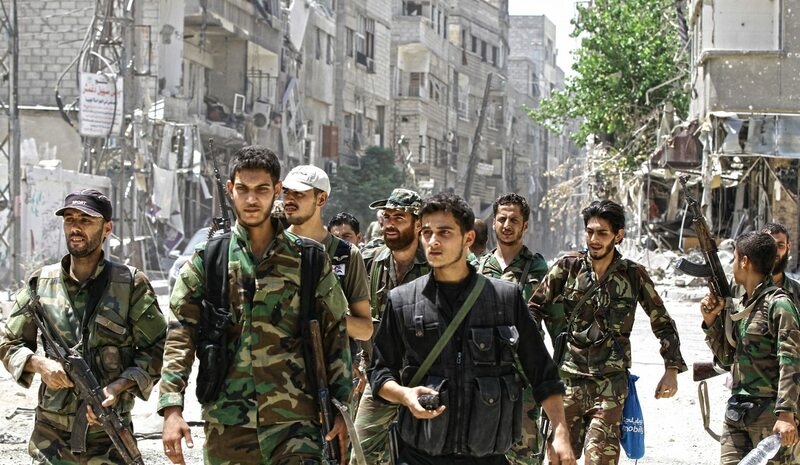 Syrian rebels had started using the neighborhood as a base to slip into the capital. With more than 150,000 people packed into a single square mile, it was easy to disappear – especially since a growing number of the residents were becoming sympathetic to their cause. The Syrian army sent in soldiers. Government fighter jets bombed a school. The army set up a ring around the camp, preventing tens of thousands of remaining residents from leaving and stopping others from going in. Soon, Yarmouk began to starve. Thousands of miles away in Abu Dhabi, Syrian businessman Mezyan Al Barazi — the unofficial head of a diaspora aid group — was scrambling to break the siege. At first, he thought the blockade would last just a few days. But it soon became clear that the troops were there to stay. Local clerics issued fatwas so that cats and dogs could be cooked to eat. Families chewed on grass or boiled it in water. By January 2014, at least 50 people had died from a lack of food and medicine. Al Barazi reached out to a member of a charity run by Syrian doctors living abroad. Hospitals and medical personnel had been targeted by the Syrian government, and Al Siraj tried to fill the gap, smuggling in some 50 health workers to field hospitals, garages, and basements. Several of the doctors working with the charity had attended events hosted by Al Barazi’s diaspora organizing committee, or Tansiqiya, sharing harrowing stories from their mission. Beyond their bravery and access, Al Siraj had resources. In December 2013, the group posted a photo of its monthly spending showing a total of $263,400. Indeed, the group had found donor support among some of Syria’s most prominent exiles, including two of the richest men in Doha: brothers Moataz and Ramez Khayyat, whose construction firm Urbacon International had won contracts to build facilities for the 2022 soccer World Cup. Their company’s Syrian offices, equipment, and land had been seized by the regime in 2011, and they claimed their loss to have been at least $200 million. Having relocated permanently to Doha, the brothers said they spent hundreds of thousands on relief work since the revolution had started. In 2014, when several businessmen provided a total of $5 million worth of flour and wheat to Syria, the Khayyats had paid $600,000 of it. Al Barazi’s contact in Al Siraj said the group could smuggle supplies through the blockade, with payments to guards to look the other way. At first, the operation seemed to have been a success. Al Barazi confirmed that small amounts of supplies had reached their destination. But soon, friends and family members began to complain, claiming that Al Barazi’s intermediary in Yarmouk was mishandling the aid. He had made a list of beneficiaries and was delivering help only to them. It was not easy to work out what was happening, and Al Siraj said it was unaware of the alleged favoritism. Yet Al Barazi knew that sorting through the tensions was vital. When aid made its way through the blockade, distribution points were at risk of being swarmed by desperate residents, scrambling for supplies. In the meantime, word got around of Al Barazi’s success at running the blockade. Others in the diaspora began to harass him, asking him to put them in touch with his intermediary. The inquiries grew strangely aggressive. Once, he would have simply assumed that his fellow exiles wanted to send aid through the intermediary as well. Now, though, he was sure something else was going on. Did rivals wish to steal the aid? Or the money? A few days later, Al Barazi’s phone buzzed with a message. It was a photo of the intermediary in Yarmouk, dead. There was nothing else – no explanation, no context. Since the beginning of the conflict, Al Barazi had seen plenty of pictures of the dead. But this was the first time that death had struck someone because of the work he was doing for Al Barazi. For weeks, Al Barazi struggled with the implications. His contact’s death forced him to confront the growing ambiguities of the Syrian conflict. Had the murder been a warning from the regime to those trying to break the siege? Had it been carried out by corrupt aid groups or businessmen seeking a monopoly on supplies going into Yarmouk? Or, was it an accident? Al Barazi assumed it was all of these things and none of them. In the end, it didn’t matter because it was a reminder that every possible adversary could equally have pounced. One day, several weeks later, Al Barazi pulled out his phone and flipped through his pictures until he found a picture of the dead man from happier times. When it was taken, the man was just 43 years old. He wore his brown hair artfully disheveled. Al Barazi kept the picture on his phone as a reminder that death could strike from any direction. An effort that had started as humanitarian aid had become entangled in the war economy. Those struggling in Syria were no longer battling only for the future of their country; millions of dollars were at play, and the opportunities for greed, envy, and violence were endless. Reaching out to the wrong person at the wrong time with the wrong information could get someone killed. But not reaching out seemed worse. On January 17 2014, Al Barazi posted an account from inside the blockade on his Facebook wall. “I asked my [friend] in the besieged camp Al Yarmouk yesterday: ‘Did you get any assistance?’ He said, ‘We got a barrel [bomb] that resulted in eight martyrs and 20 wounded,’” he replied.” Al Barazi’s next message was directed at Bashar al-Assad: “Damn your soul,” he wrote. Yarmouk would prove only the beginning of how the violence tore apart the diaspora’s humanitarian operations. Each time they put together a shipment of food or medicine or clothes the Tansiquiya had to check and double check who, if anyone, was left to receive it inside Syria. One recent container had been ready to go when Syrian government planes bombed its destination, the small town of Morek. The residents fled down the road, joining other displaced Syrians in a squalid makeshift camp, but as Al Barazi was preparing to redirect the shipment, the planes struck again. Having spotted the tents and roadside fires, they attacked, killing fifty-two women and children who had survived the destruction of their village. The aid intended for the village sat in a warehouse in Dubai, in need of a new recipient. Getting cash to family and friends, meanwhile, had become nearly impossible. In order to limit the risks of terror financing, the UAE had shut down most money wiring services to Syria. One exchange house still conducted transactions, but sending money was risky. The Syrian government monitored the banking system for transactions that might indicate the recipient was an opposition liaison. In order to avoid detection, donations had to be split into dozens of smaller transfers and sent indirectly via people in cities and towns surrounding the final destination. Businessmen could serve as unofficial brokers, but that was costly and difficult to arrange. “There are people fleeing the country, and they want to get their money out [of Syria],” explained Rani, an expat involved in a Tansiqiya in Dubai. “We say, ‘we’ll give you money here [in the UAE]’, and they release the [equivalent amount of] money inside.” By late 2014, the war had cost the Syrian currency, the pound, three-quarters of its value, and people outside Syria could disguise money for the rebellion as an opportunistic currency play. Yet even as sending aid became harder, Al Barazi’s family in Syria grew more dependent on him, not just for help, but survival. Since the beginning of the conflict, 24 members of his extended family have died fighting the regime – and their sons, daughters, wives, and mothers turn to Al Barazi as a lifeline, fleeing to housing he arranges in planes or buses he pays for. A sister-in-law lives in an apartment he owns in central Damascus, a vestige from better days. Armed men recently came knocking on the door demanding she leave. Through a lawyer in Damascus, Al Barazi was able to forestay her eviction – for how long he can never be sure. “At any moment, they are waiting to take her,” he says, as if adding, that’s just how it is. Amidst it all, Abu Dhabi’s Tansiqiya is expanding as the existing diaspora absorbs hundreds of thousands more Syrians, fleeing to the Gulf and Europe, as well as millions in neighboring countries like Turkey, Jordan, and Lebanon. In the UAE alone, expats estimate that some 100,000 Syrians have recently arrived. In countries like Jordan, the pre-existing Syrian diaspora has been outnumbered ten times. Every Friday afternoon, Abu Dhabi’s seaside corniche bustles with families picnicking in the sun. A few times a year, the Tansiqiya posts a call on Facebook for its ranks to gather on a shady patch of grass, where they dine on mezze and grilled meat and sip cool yoghurt drinks. Al Barazi shows up early; he pitches his chair toward the front of the lawn to watch the crowds arrive. After everyone has accepted a glass of juice and eaten at least a handful of dates, the wallets snap open. A doctor from Dubai counts bills, pausing to tell his son not to ride his kid-bike across the picnic blanket. A mother of three hands over several hundred dirhams. Tansiqiya members collect the donations in unlabeled envelopes without ever saying a word about the bills changing hands. The Syrian diaspora is fast running out of money. Fundraisers that once would have pulled in more than $10,000 now barely top a couple thousand. By some estimates the fighting in Syria has destroyed nearly half of the country’s economy, and attending to the accompanying suffering has cost the diaspora most of its accumulated wealth. Four years of neglect has driven Al Barazi’s company into the ground. Consumed with Skype calls to Syria and requests for assistance, Al Barazi failed to seek out new contracts, and one by one the old ones expired. Once again, Syria has claimed his life savings and destroyed the business he built. Where he once contributed $1,000 a month to the cause, he now struggles to send even $300. “This conflict is getting long,” he says. Even if the fighting were to end today, the depleted savings of thousands of Syrian expatriates will slow down the country’s recovery. Four years ago, Al Barazi would have been well placed to expand his business back into a stable Syria; he could have invested in a showroom, re-cultivated abandoned farms, and helped resuscitate the country’s agricultural industry. Instead, he and fellow exiles spend their money shipping seeds to besieged areas of Syria, where subsistence farming is the latest survival strategy. Al Barazi may have been bankrupted once again, but this time he got something for his money. The conflict in Syria has destroyed the country he came from, but in doing so, it created a community where there was none, built a nation – of exiles, yes, but a nation – that did not exist before. These days for the Syrians gathered at the seaside, the funds being raised are of only secondary importance, says Al Barazi. In exile, the Tansiqiya can build an ideal of Syria that no longer exists back home. In the memories of the diaspora, the country takes on an a luminescence tinged with nostalgia: the recollection of a land foreign to war and violent death. That idea of Syria long existed in their imaginations, but only now, abroad, does it have ground to sit on. Godfathers and Thieves is published by Deca. Download the full story here. Elizabeth Dickinson is a Gulf-based American journalist whose writing has appeared in The New Yorker, Foreign Policy, The Economist, The Christian Science Monitor, and The National, among other publications. She is the author of the Kindle SingleWho Shot Ahmed, an account of a young videographer shot in cold blood at the height of Bahrain’s Arab Spring. She is also co-editor of the recent book The Southern Tiger, a narrative memoir by Chilean President Ricardo Lagos. She has reported from five continents and speaks French, Spanish, and Krio (Sierra Leone), as well as basic Yoruba and Arabic. Launched in June 2014, Deca is a journalism cooperative that creates long-form stories about the world to read on mobile devices. The group’s members have authored acclaimed books and published magazine articles in such outlets as Harper’s, The Atlantic, The New Yorker, GQ, National Geographic, and The New York Times Magazine. Deca’s writers include Pulitzer Prize, National Magazine Award, Livingston Award, Kurt Schork Award, George Polk Award, Michael Kelly Award, and Frontline Club winners and finalists. Learn more at www.decastories.com. Photo: Syrian troops on patrol in the town of al-Mleiha, ten kilometres south east of Damascus 15 2014 during a government-organized trip for journalists. Syrian troops captured the town a day earlier from armed groups following five months of heavy fighting. EPA/YOUSSEF BADAWI.